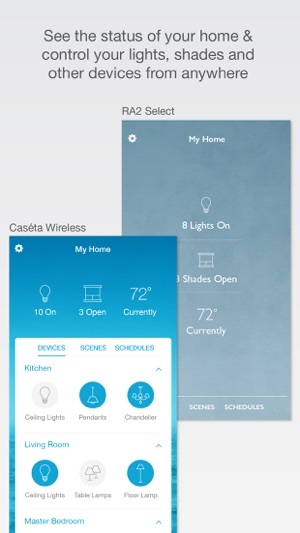 Easily setup and control your home's lights, shades, fans, temperature and Sonos rooms from anywhere with the Lutron app on your iPad, iPhone, iPod touch, and Apple Watch. 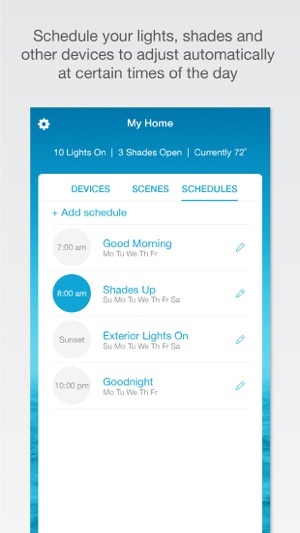 Control lights, shades, fans and temperature in the comfort of your home or from anywhere in the world – the office, the airport, the beach – so lights aren't left on, shades aren't left open, and your HVAC is set back while you're away. - Get your house ready for the upcoming spring - we added support for the new Caseta fan control! 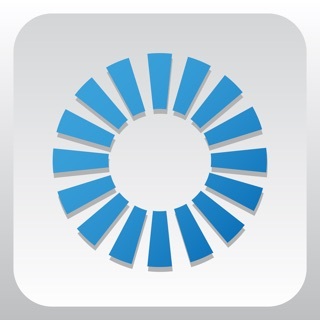 - You can also control your fans with voice in Caseta and RA2 Select. - Additional various bug fixes and improvements. Alexa will work but not as well as Siri. But Siri only works well with the iPhone. The watch does download the app but does not let you control anything. I had to delete My Home in HomeKit and reload the bridges to get it working. That is crazy. Also, the app watch does not let you access devices. It only lets you access scenes. So unless you create a scene you will not see your device. So create a scene to turn on a light and create a 2nd scene to turn off the light. Not very smart. With all that said, I don’t think there is a better hardware device for switches. Add Hue Lights to Caseta and you have an amazing system. The 30ft Range is not a problem for me yet but at a minimum they should create a mesh of Bridges that could add 50 devices each. So that with 3 Bridges one could handle 150 devices. 2 Bridges with 2 separate accounts is not an acceptable solution. And the expensive custom “RA2” which is a premium to the “Caseta” system is not HomeKit ready which means that even for free no one would want that outdated expensive system. Currently you can only do 50 switches on Caseta, which means you have to be selective on what to use Caseta. May be light switches using Caseta and use a different Brand to control power plugs. Thanks for your feedback on our Apple Watch app and hardware! 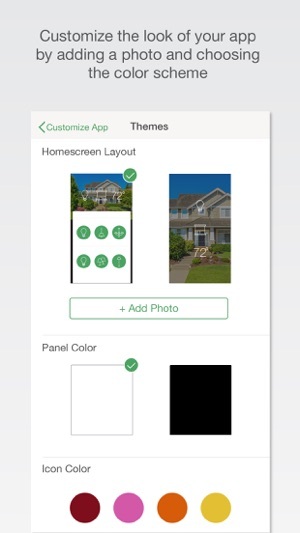 You can customize what Lutron devices appear in our watch app from the iPhone app Settings menu under 'Apple Watch' - you can chose items from your scenes, lights, and shades. We understand your concerns about the 50 device limitation and are committed to making improvements. 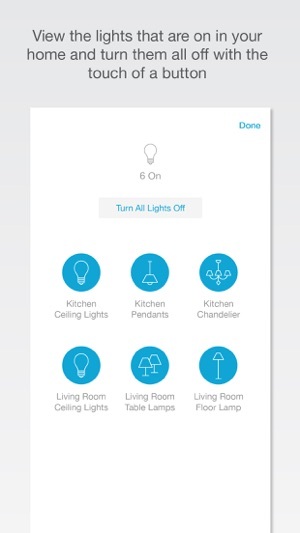 Our currently available professionally installed solutions are RA2 Select (up to 100 devices), RadioRA 2 (up to 200 devices), and HomeWorks QS (large scale) - all which can be used with HomeKit. Please let us know if you have any other questions, concerns, or feedback! The possibilities with this system are endless and I have a lot of different scenes set up and automatic scenes set as well. The right lighting levels in your home make all the difference in the world, and I have dimmers set that ensure my plant lights with plant lights around the house receive adequate lighting while I'm at work. 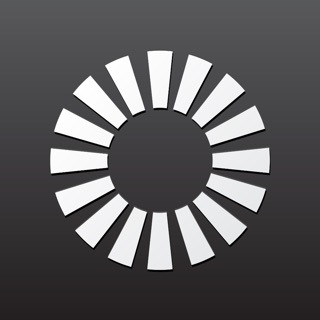 I never have any issues with the app and I can easily adjust lighting from my iPhone, iPads, even my Apple Watch in a pinch. And I have a few wireless remotes in the remote cradles and remotes mounted on walls with regular switch plates that work just light regular dimming light switches. I also have the hub which is key and it integrates with Apple HomeKit so you can let Siri adjust things for you too. When friends and family come over they're seriously blown away - it's professional-grade. It's not exactly cheap, but I'm not looking for cheap - I want something that works flawlessly and that doesn't cost an arm and a leg either. Switching lighting scenes couldn't be simpler. Combine that with auto shade adjustments and even temperature control and jaws drop. For me it's the ultimate convenience that I love, and being able to achieve the perfect lighting levels for every occasion. I can't imagine going back to the days of constantly having to flip switches on and off around the house. I've tried others and this is by far the BEST. I love this system. I'd never go back - Look no further. Sean702, thank you for the positive review! We hope we can continue to wow you (and your family) for years to come. I generally love my Casita system. I control a whole house lighting system and a window shade system in one room. The system is reliable, easy to set up and pretty fool proof. My biggest complaint is the limit on the number of Casita devices allowed on the bridge. Currently this number is capped at 50. When you consider that the bridge counts as one and a room with a light and say 3 switches counts as 3, and each window shade counts as one, you can easily run out of devices on the bridge. I have cheated and am currently running 2 bridges on 2 separate email addresses but am then required to separate devices and use two separate iPads to control the system. 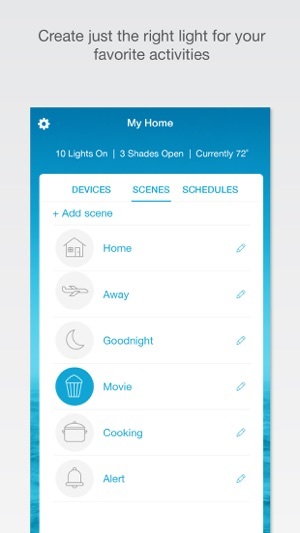 If Lutron would allow the app to access multiple bridges or sell a bridge with say 100 devices, the system would be perfect. Thank you for sharing your feedback about the maximum device count on the system, we are listening! We will pass this along to our business team for consideration. © 2019 Lutron Electronics Co., Inc.